As we get ready to begin the World Series tonight, let’s remember the only no-hitter ever tossed in the fall classic. 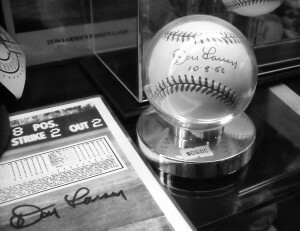 The New York Yankees’ Don Larsen threw a perfect game in Game 5 of the 1956 World Series for the first no-hitter in postseason history and the only in World Series history. Larsen retired all 27 Brooklyn Dodgers batters he faced at Yankee Stadium on Monday, October 8, 1956, for a 2-0 win. The only other postseason no-no came 54 years later. The Philadelphia Phillies’ Roy Halladay threw a no-hitter against the Cincinnati Reds in the first game of the National League Divisional Series in 2010. Dirk Lammers is a veteran journalist who began rooting for the New York Mets in the early-1970s when the team’s no no-hitter count was barely 2,000 games old. Lammers has since turned his research into Baseball’s No-Hit Wonders: More Than a Century of Pitching’s Greatest Feats (Unbridled Books). Angela Lammers liked this on Facebook. regular-season games (and 34 post-season games) without a no-hitter. The streak began 50 years, 0 months, 12 days ago, when the Padres played their first game. regular-season games (and 74 post-season games) before the Mets' Johan Santana no-hit the St. Louis Cardinals on June 1, 2012. There have been 299 no-hitters in MLB history, with the last thrown 11 months, 12 days ago.